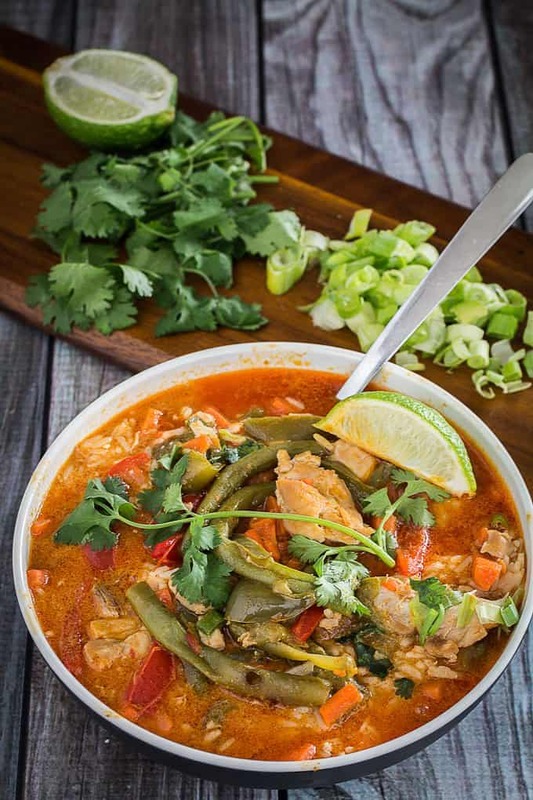 One Pot Coconut Chicken Curry is a combination of tender chicken thighs, fresh bell peppers, carrots, and string beans swimming in a pot of red curry sauce and served over rice. You can make this dish as spicy – or not spicy – as you want. The best part about this dish? It only uses one pot, and is ready in 30 minutes! I’m on a one pot dish kick this month. I’ll be honest with you, I just don’t feel like making complicated dishes lately. Maybe it’s a combination of my lazy pool-side summer finally coming to an end, or that I’ve been traveling so much. But the thought of getting out multiple dishes and cleaning them up afterwards just doesn’t appeal to me right now. 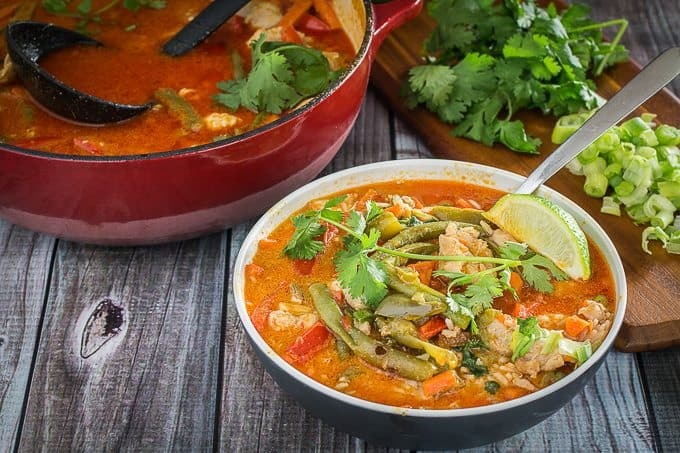 Which is why this one pot coconut chicken curry with vegetables is absolute perfection in my eyes. 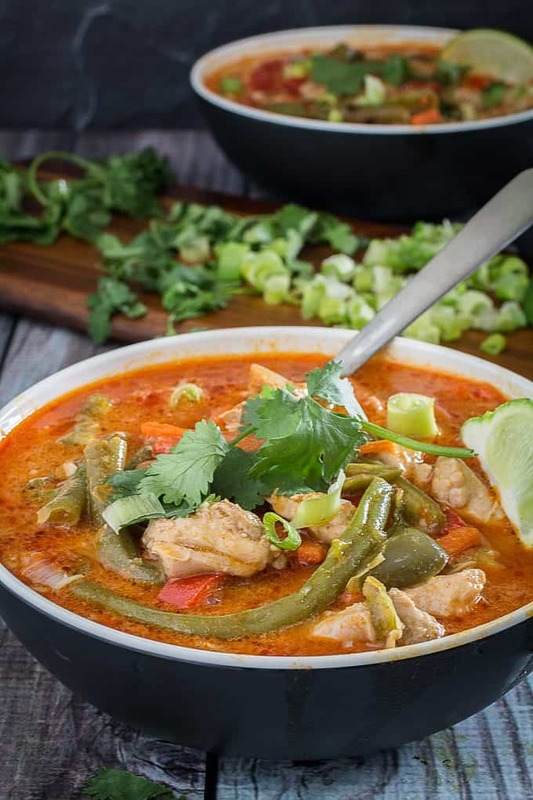 It uses chicken thighs, which are super tender and juicy by nature, and fresh colorful veggies likes green beans, bell peppers, and carrots. 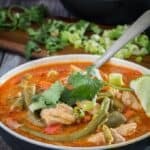 All of these amazing ingredients are swimming in an even more amazingly fragrant red curry sauce, spices, and topped with fresh cilantro and green onions. And it just gets better, because this coconut chicken curry dish is ready in only 30 minutes! Making this the next perfect weeknight meal. I could seriously eat this 5 times a week. In fact, I’ve probably had about that many bowls already this week, which might mean it’s time to make more! I’m the type of person who likes repetition. I can watch my favorite movie every day (which is It’s Complicated with Meryl Streep, just in case you’re wondering), and when I find a dish I like, I can eat the same thing over and over until I run out. I know what I like, and I don’t care who knows it! I’d probably even eat this for breakfast. I don’t subscribe to the “breakfast foods here, dinner foods there” idea. Variety is the spice of life, isn’t it? Unfortunately, Andrew doesn’t quite feel the same way. He likes variety in movies, and variety in the food he eats. And I’m pretty sure he’d be expecting something more traditional for breakfast, like my gluten free sweet potato breakfast bars, or a an egg-filled breakfast casserole. Lucky for him, I run a food blog, which means I’m pretty constantly making new dishes, so he has plenty of variety to pick from. I, on the other hand, will be worshipping this coconut chicken curry for the foreseeable future. One of my favorite parts about this coconut chicken curry is the vegetables. Ok, I hope I didn’t lose you there. Hear me out! They’re not just vegetables anymore. They’re nutrient-packed little flavor vessels to transport the amazingly savory curry sauce from the bowl to your mouth in the most delicious way possible. See, you can have your cake vegetables and eat it them, too! Don’t think you have to stick with the peppers, carrots, and green beans I’ve put in the recipe here. Ohhhh no. You have free-range of vegetable choices here. In fact, I recommend using up whatever you have floating around in your refrigerator for this one. Even leftover potatoes from yesterday’s dinner. Anything goes here! I’d even venture as far as throwing edamame in here. And if you want to get REALLY crazy, throw this coconut chicken curry over some quinoa you’ve cooked up. Edamame and quinoa? Hello, protein-packed nutritional delight! Personally, I ran out of quinoa this week, so I served mine over rice. I’m also reserving my edamame for the giant pot of Miso Salmon & Vegetable Stew I’ll be making today. Which is one of Andrew’s favorite dinners of all time, by the way. Hey, it’s grocery shopping day, you gotta make due with what you have, right? Right! Let’s get creative here. Which is why this coconut chicken curry is so perfect. You can honestly throw any veggies you have in there, and it’s going to be delicious. I’ve even used frozen veggies in here, and it takes a few more minutes to cook but still ends up delicious in the end. Can we take a minute to talk about coconut milk? I used the light version here, in an honest attempt to somewhat cut down on calories. But what this means is that you can serve this up as a dairy free dinner, too! It has all of that creamy deliciousness you’d expect from a milk-based dish, but remains the perfect dairy free alternative. You can also make this a vegetarian coconut curry by added firm tofu instead of chicken. We’ve done that before, and it was still the most beautiful thing I’ve ever eaten. Ok, maybe not ever. But you get the point. Because curry appetites are a thing, once you realize how incredibly delicious curry can be. 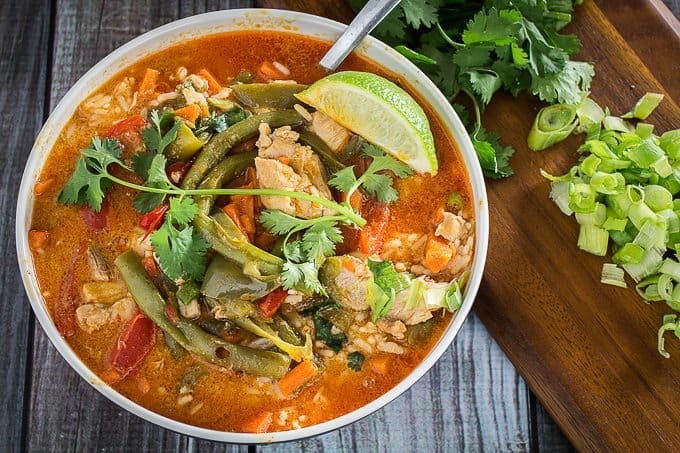 One Pot Coconut Chicken Curry is a combination of tender chicken thighs, fresh bell peppers, carrots, and string beans swimming in a pot of red curry sauce and served over rice. You can make this dish as spicy - or not spicy - as you want. The best part about this dish? It only uses one pot, and is ready in 30 minutes! In a large dutch oven, heat oil and butter over medium heat. Add chicken and cook until chicken is no longer pink. Add coconut milk, curry paste, peanut butter, and tamari. Stir until combined. Stir in carrots, peppers, and green beans. Bring to a simmer. Cover and cook for 5-10 minutes, or until vegetables are soft. Serve over rice and top with cilantro and green onions. You can use any vegetables you have for this dish!